Sweetie Pie’s Mac and cheese is s creamy, cheesy, delicious macaroni and cheese from a famous St. Louis soul food eatery! It is hard to turn down a comfort food like this one. Try it—you’ll see what I mean. Here’s a creamy, cheesy, delicious mac and cheese from a famous St. Louis soul food eatery. People who have eaten this mac and cheese at Sweetie Pie’s say it’s the best they’ve ever had. 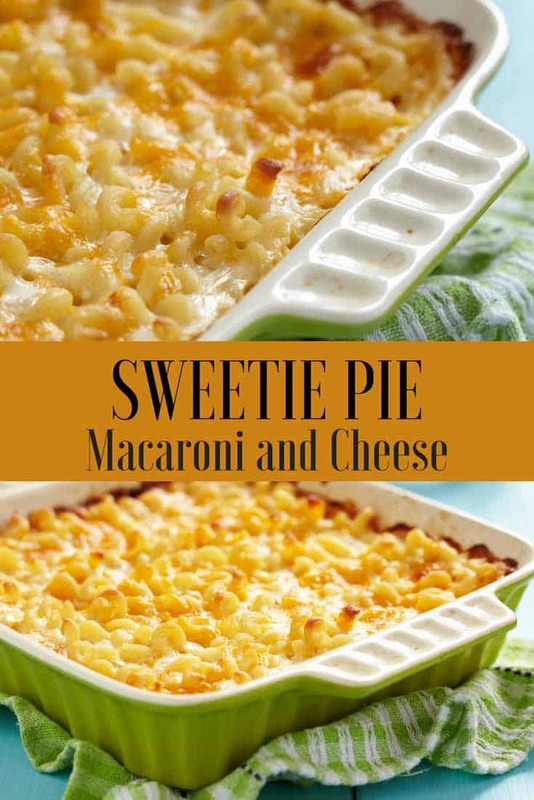 Not everyone can get to Sweetie Pie’s, but now you can make their mac and cheese at home! It’s hard to turn down a comfort soul food mac and cheese like this recipe. Try it, and you’ll see what I mean. The owner of Sweetie Pie’s is Robbie Montgomery (known to everyone as Miss Robbie). As the oldest of nine children, she learned to prepare dozens of her mother’s classic soul food dishes. She led a very wonderful life as a talented vocalist and was a backup singer (an Ikette) for Ike and Tina Turner. While on the road, she often prepared meals for the band on hot plates in hotel rooms. She subsequently toured with other famous musicians, but when she eventually returned to St. Louis the drive to open a restaurant was overpowering, and Sweetie Pie’s was born. Sweetie Pie’s has become a St. Louis landmark and a must-visit for anyone looking for delicious comfort food and great service. You can read more about Miss Robbie’s inspiring life by clicking here. Mac and cheese is so familiar that you’ve probably never even thought that it has a history. As far as the United States is concerned, Thomas Jefferson met up with macaroni in Paris. In 1793, he asked the American ambassador to Paris to buy a machine for making it. However, the device apparently didn’t work out, or Jefferson just found it easier to import both macaroni and Parmesan cheese for making dishes at Monticello. In 1802, Jefferson served up “a pie called macaroni” for a state dinner. Since that time, baked mac and cheese has remained a popular dish. You can read a lot more about the history of mac and cheese by clicking here. Once you’ve had real homemade mac and cheese, the orangy-looking box mix will never be the same! Homemade mac and cheese is always the best. This CopyKat recipe is not Sweetie Pie’s original, but it’s pretty close. Your family will love it, and it’s perfect to take to a potluck – everyone will keep asking you how to make it. 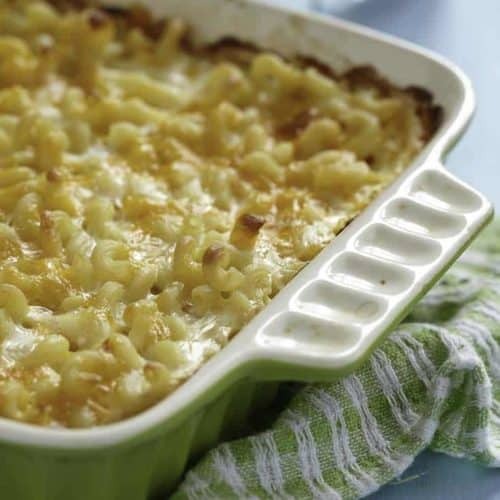 Looking for other great recipes for Macaroni and Cheese? Be sure to check out these. Longhorn Steakhouse Macaroni and Cheese – This is a 4 cheese blend macaroni and cheese that also features just a touch of bacon. Stouffers Macaroni and Cheese – this will remind you of the one you used to bake in the oven, it is cheesy goodness at its best. 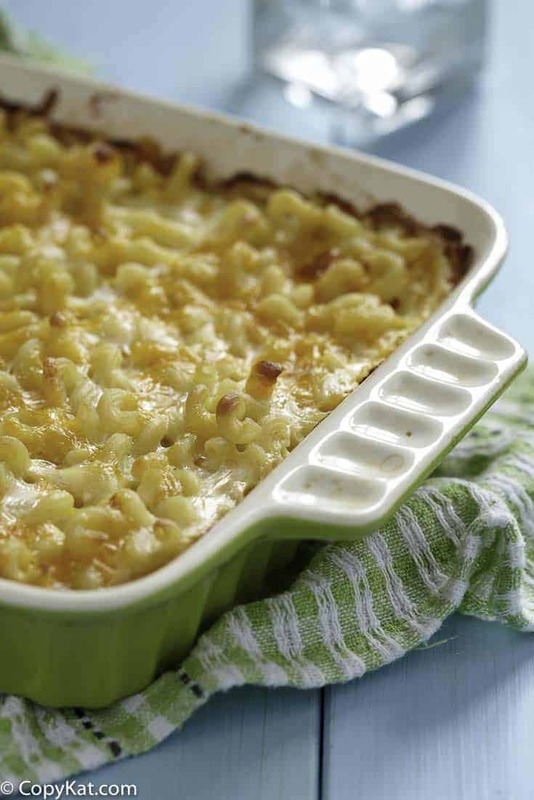 Boston Market Macaroni and Cheese – this velvety smooth cheese is so hard to beat. Homemade Macaroni and Cheese – One of my favorite recipes that I adore. Martha Stewart Macaroni and Cheese – this one feature multiple types of cheese. This one is just plain decadent. 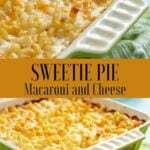 You can recreate Sweetie Pies Macaroni and Cheese at home. Bring a large pot of lightly salted water to a boil. Cook pasta according to package directions. Drain and transfer the pasta to a 9×13-inch casserole dish. Set aside. In a large bowl, combine the whole milk, evaporated milk and eggs. Mix with a fork until thoroughly combined. Add the butter and Colby, Monterey Jack, Sharp Cheddar, Sour Cream, and Velveeta cheeses to the pasta. Pour the milk and egg mixture over the pasta. Season with salt, pepper and sugar, and toss. Sprinkle the top of the pasta with the remaining cup of American or Cheddar cheese. Bake for 30 to 45 minutes (or until the top is lightly golden brown). I Follow the directions except for the white pepper and it came out perfect . From a woman who been making Mac and Cheese since she was 8yrs old I know it had to be good. Thanks Sweetie Pie . when i seen it on your show it was looking so good i had to try it i love Mac and Cheese . Regarding white pepper, back in the day (and in this day to be correct), you used white pepper in dishes that were light in color as in mac & cheese, sauces and such. The addition of the small amount of white pepper could not have changed the taste to it being nasty! Something else may have been the problem. I am so glad that you enjoyed the recipe. I personally love white pepper and the addition it makes. I often use the white pepper when I want some spice that is more sharp and more subtle. Kelly, I am happy to hear you enjoyed the recipe. I love the addition white pepper can add to a recipe. It is nice, a little spicy, and perfect for so many dishes. Thank you for giving this recipe a try. I made this with my own touch for easter and everyone loved it. Ive made this several times and its a hit, but i never used white pepper either nor the velveeta…i use cracked black pepper and replace the velveeta with another type of shredded cheese. I love it! I did too, and it turned out perfect. Next time I will add a little sour cream in it. Hi, it’s me again. I should have mentioned I did’t use “white pepper.” I used “black pepper” to taste. Other than that, I followed the recipe … and it was PERFECT! I did the same and everyone loved it! Once you’ve had real homemade mac and cheese, the orangy looking box mix will never be the same! Plenty of cheese and buttered crumbs on top. We even made it for our Christmas dinner one year! I couldn’t agree more . Homemade Mac and Cheese is always best. I never would have thought a small amount of white pepper could have turned someone off so much. Often spicier notes are used in Mac and Cheese to enhance its flavor. I made this tonight as a trial for my Labor Day cookout and OMG it is so yummy! The creamiest mac and cheese I’ve ever had! I have never made a baked macaroni and cheese before ( only from the box )and have been anxious to make one so I finally got to try this one last night for dinner. Everyone loved it!! They said it’s a keeper! Will def make this again. I had this dish at sweetie Pie about 3 months ago it is the best however she also put sour cream in her mac and cheese. I had this mac and cheese last summer when I visited Sweetie Pies…this was the best I’ve ever had, I’m so glad I can make it at home!